How to prevent Income Tax Raid? Home » Incometax » How to prevent Income Tax Raid? Income tax raid is very scary word for normal person. Most of the people are afraid of income tax raid or query from income tax. 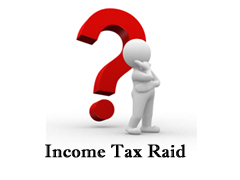 In this post we will try to understand what is income tax raid? and how to prevent it. What is Income Tax Raid? As a tax payer we have to follow Indian income tax rules in terms of paying tax on our income. If we don’t pay tax honestly or try to hide our income on which tax is applicable authorized officers of the IT department can search residential and business premises, vehicles and bank lockers for unaccounted money this search operation is called as Income tax raid. If unauthorized transactions are found Income tax officer can seize the account books, stocks and valuables. Filing Income Tax return honestly – One should make a full and true disclosure of one’s taxable & exempt income. Avoid high value transaction – IT department receives information about high value transaction from bank & financial institution. Following transaction are considered as high value transaction. Don’t introduce fresh capital over 10 lakhs. Don’t sale property for lesser amount than Govt. Valuation. It is advisable for an assesse to declare the nature and source of every nontaxable income or other receipts in the income tax and wealth tax returns, or in a statement enclosed with the returns. If Income tax has given summons or notice, one should comply with summons or notices to prevent a tax raid. Preserve important receipts and other documentary evidence for any high value transaction with detail about source of income. Do keep proper records of income, assets and wealth for each of your family members including receipts, bills, bank account statements, credit card statement, copies of tax returns etc. Always make yourself updated about Income tax rules & statutory provisions of the Income Tax Law. Where gold ornaments or jewelry have not been purchased by the owner but have been acquired by way of a gift on some ceremonial occasion or otherwise it is advisable that records carefully preserved. I hope above tips will help you in keeping Income tax department away from you. If you feel this information useful do share it with your friends or relatives so they can also follow these tips to prevent Income tax Raid. Income Tax Search survey and raid – What to do? How to deal with Income Tax Notice?